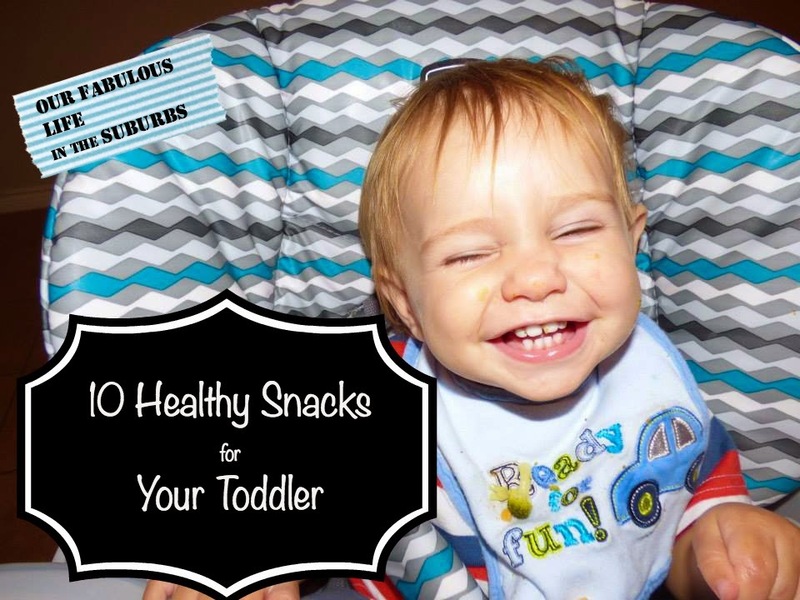 If your child has reached toddler age, you know how important snacks are. I'm pretty sure Grayson snacks about 75% of his waking hours. He's constantly running to the pantry and pulling things out. It is unreal how much that tiny human can eat. So I've learned that I need to be prepared at all times with lots of healthy things for him to chomp on, so I don't resort to just handing out Annie's Bunnies (aka organic goldfish crackers) all day long. Although I won't lie, that kid eats a lot bunnies. If you're just entering the toddler phase, or are simply running out of ideas, I thought I would share my favorite snack options that I usually have on hand. Not all of them are totally and completely healthy, although we do try! We really love Stonyfield Organic yogurt, and that's pretty much all we buy. Grayson's a big fan of the pouches, but he likes to dump those out sometimes (of course). So occasionally I'll put some in a sippy cup with some milk mixed in, or sometimes I'll put a little bit in a bowl for him and let him dip his cheerios or waffles or fruit. Right now we only buy the Yo-Baby or Yo-Tot versions, because it's made with whole milk, which is recommended for littles. This is a snack that wasn't a big hit at first, but I recently found some organic applesauce pouches at Target, and he really seems to dig them. Obviously we want him getting plenty of fruit, so this is a great way to get it done. I think part of the draw in this snack is the fact that he gets to feed it to himself, which is obviously huge with an independent little tot. Cheese slices are a big hit around our house. We've tried cheese sticks and cubes and every other variety available, but his favorite seems to be the American cheese slices (our faves are Horizon Organic). I typically give him one slice of cheese with a slice or two of turkey from the deli. I realize deli meat isn't the healthiest option, but I convince myself it's OK because he's getting lots of good protein this way. Another common pairing with our cheese slices are grape or cherry tomatoes. So far he's not showing a preference of one over the other, so I go with whatever I happen to find first at the store. One big suggestion: be sure to cut these up. If your child is anything like mine they love to swallow things whole, and these little tomatoes are the perfect size and shape to choke on. I know this is a strange one, but in my household cottage cheese is about the best snack a kid could have. He absolutely loves it, and I'm not arguing. There are several organic options out there, and it's a great source of protein and calcium. I've never been a cottage cheese fan myself, but I tried it when I saw how much he loved it, and it's surprisingly pretty tasty. Definitely worth a shot! I can't take much credit here. Smoothies are a Grayson and Nana thing. But I absolutely encourage it! Nana makes them with almond milk, frozen fruit, and kale, and Grayson laps this stuff up like it's the best thing he's ever had. The great thing about smoothies is that you can slip all kinds of stuff in there and they will never realize it. Such a great way to get in fruits and veggies for picky eaters, because I don't know too many kids who will turn down a smoothie. This idea came out of a bare fridge and a very hungry child. We'd let him try edamame before when we'd been out for sushi, and he seemed to like it, so I decided to give it a try. Of course I got the beans out of the shell, and he ate them faster than I could hand them over. Huge hit! Edamame is a great source of protein, iron, and calcium, so it's a winner in my book! Plus, mama likes to snack right along with him on this one. Grayson loves his veggies, but isn't a fan of fruit. He's a strange one, I tell ya. I'd tried basically every fruit, and he would just spit it right back out. Thankfully, we finally figured out the trick, and that is to make his fruit of the frozen variety. Blueberries and strawberries are his favorites, and he's even been known to snack on a frozen pineapple now and again. I usually give him a little cup with a variety of things, and he goes at it. I try to stay away from packaged stuff for snacks when we're at home (except for those dang bunnies that he can't get enough of), but when you're on the go, nothing's better than a little fruit or granola bar. Target (or anyplace, I'm sure) has tons of options, and there are usually a handful of organic choices, too. We go with Ella's Kitchen Nibbly Fingers most of the time, but we've tried several others and have never found one that he refuses to eat. I make sure the diaper bag is stocked with several of these at all times. I don't know about you, but my toddler looooves to dip his food in things. I've figured out that he will eat just about anything if I give him something to dip it in. This is a great way to get him to eat fruits and veggies when he's being stubborn, and I've also given him little organic animal crackers, cheese sticks, and tortilla chips. For dip, I usually go with yogurt for sweet stuff, and guacamole, hummus, sour cream, cottage cheese, or really anything else on hand that could sub as a "dip" in his eyes. It's also a great way to keep him busy for 10 minutes so I have time to load the dishwasher! So, now you tell me - What's your toddler's favorite snack? I'm always looking for new things to try, and luckily I have a child that will eat just about anything, so it's fun to experiment! That's what my toddler loves too - fruit straight out of the freezer! Spinach frozen out of the bag too! These are such great snake ideas!